The Phillies are in a bind. The trade deadline is rapidly approaching and they don’t really have anybody to trade. 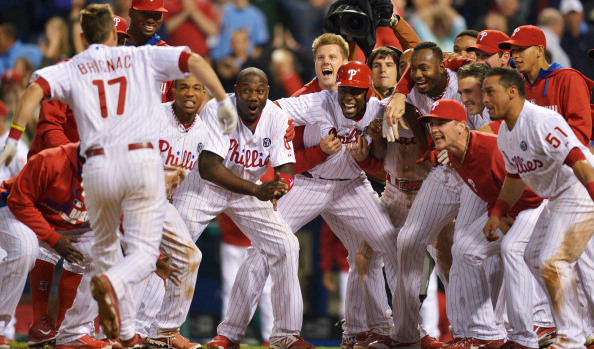 Jimmy Rollins and Chase Utley don’t want to leave. A.J. Burnett, Cliff Lee, and Jonathan Papelbon all just crapped the bed in front of a stadium full of scouts. Carlos Ruiz just had a concussion. Even John Mayberry, Jr. is hurt. Teams aren’t going to give up what RAJ wants for Cole Hamels. The phans want a trade and the team needs a trade. Somebody simply must get traded. Enter, Reid Brignac. Why would anybody want Reid Brignac? Because he wins baseball games. Brignac is 6th on the Phillies in batting average, 5th in on-base and slugging percentage, 4th in OPS and OPS+, and he’s 3rd in BAbip. The most important statistic is that Reid Brignac leads the entire MLB in “walk-off win” (WOW) rate. He has a WOW of 3.03. This means that in over 3% of his plate appearances, he will hit a walk-off hit. He has 2 walk-offs in 66 plate appearances thus far in 2014. If you translate that into a full season (600 at bats), Reid Brignac is personally going to win 18-19 games for your team. Nobody else in the Majors even comes close. The Phillies should get quite the haul for someone who is this valuable to a team’s success. This is even more true when you account for his miniscule salary impact ($449,000). Plus, he doesn’t become a free agent until after the 2016 season has concluded. Which teams would be interested in a player that makes them win 18 more games a season? All of them would. DO IT RUBE! This entry was posted in The Phillies and tagged Phillies, Reid Brignac, statistics, trade rumors, WOW. Bookmark the permalink. Smh at you wanting the Great Brignac traded. He’s the only one with trade value!